"Custard buttercream (German buttercream) is a very rich buttercream icing made with the addition of custard. You can change it up by adding different flavors or liquor. This is my basic time-tested recipe for decorating cakes and cupcakes. Makes enough buttercream for one 3 to 4 layer cake or 24 cupcakes." Beat egg with a fork in a small, heavy saucepan. Mix in sugar and milk. Heat on medium-low heat, whisking constantly, until it just starts to boil. Continue beating rapidly until mixture thickens to a thin custard consistency. Remove from heat and cool completely, about 1 hour. Beat butter in a bowl with an electric mixer until light and creamy, about 5 minutes. Add cooled custard, 1 to 2 tablespoons at a time, beating well after each addition. Beat in rum and vanilla extract. Keep beating until buttercream is very light and fluffy. A rich buttercream perfect for piping. It is important that custard is completely cooled before using or it will melt the butter. The custard can be made ahead and chilled in the fridge until needed. This recipe contains quite a bit of butter, for ease of decorating with a pastry bag and to help the piped icing to hold its shape. If you don't intend to create elaborate decorations and just want to simply ice your cake, you can decrease the butter to 1 cup. If you are using the buttercream to decorate a cake or cupcakes, make sure baked goods are cooled completely to prevent the buttercream from melting. For best results when using a pastry bag, chill the buttercream in bag in the fridge for 1 hour. 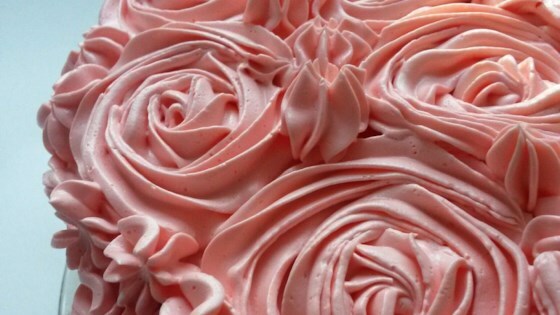 Chilled buttercream creates better defined shapes when used for cake decorating. Good flavor, fluffy and easy to work with. A good introduction to egg buttercream frosting: not as intimidating as Italian or Swiss buttercream but not as stable in hot, humid weather. Did not like it. Way too much butter. Not a very good flavor.